Jazz BCN Apartments is a new concept of accommodation in Barcelona inspired by the Jazz genre. A place designed for people looking for comfort, style and all amenities included. Jazz BCN Apartments buildings are strategically located in a quiet residential area of Eixample, just 5 minutes from the Sagrada Familia. Recently renovated, each apartment combines stylish and modern furnishing details. Hot Jazz 21 apartment takes its name from the genre Hot Jazz; polished melodies and wind instruments. Following this concept, the apartment has been designed to provide an atmosphere of tranquility. As well, it features two pleasant bedrooms, a fully equipped kitchen and a living room with plenty of natural light and nice terrace. It will be the ideal place to enjoy a dream vacation thanks to it nice terrace. * Recommended for family or group of friends. nice and safe place to stay away from city noises. just few blocks away from 24hrs supermarket and metro. also few mins walk away from famous sagrada familia.- Habitat Apartments reply: We have enjoyed reading your review of our apartment. It is lovely to hear that our guests could take advantage of our optimal location in the center of Barcelona. Thank you! Nicely located for our interest. Clean and confortable. The apartment Hot Jazz 21 is located in Sagrada Família area. The Jazz Apartments are located in a quiet residential area of Eixample but with many cafés, bars and restaurants to choose from nearby. It is 5 minutes walk from the Sagrada Familia, and from Sant Pau Hospital, a gem of the modernist architecture. Plus, the Old Estrella Damm factory is just 500 metres away. You will find nearby public transportation by metro (San Pau/Dos de Maig station - line 5) and bus, supermarkets, restaurants, bars, shops and playgrounds. In 10 minutes you can reach the main centre of the city and be on the Ramblas. Metro stop - 153 m.
Metro stop - 955 m.
Hospital Sant Pau - 0.54 km. An old hospital that is now a museum due to its incredible architecture and sheer size. It was designed by modernist architect LLuís Domanèch i Montaner in the early 20th century. Sagrada Familia - 1.05 km. The Sagrada Familia is one of the most famous landmarks of Barcelona, ​​and doubtless one of the most impressive sights of the city. Torre Agbar - 1.50 km. Torre Agbar - the big red and blue illuminated tower next to Plaza de las Glorias is one of the landmarks of Barcelona. La Sagrada Família is a neighborhood surrounding the Barcelona’s most famous basilica with the same name, the stunning Sagrada Família. The area is vibrant and away from the most touristic parts of the city. 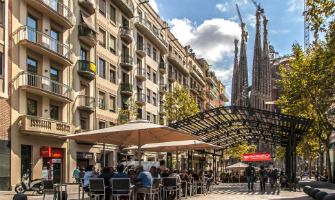 From La Sagrada Familia you’ll find local lifestyle, quietness and many restaurants and bars. The apartment was very nice! No complaints, an above average stay! Would maybe stay closer to La Rambla next time. + ) Central location in quiet and safe neighborhood. Near to the metro, restaurants and shopping. The apartment was clean, fully equiped in all that you need to enjoy the stay. -) By check in, the service was very reserved, maybe tired from work and welcoming to much guests... We did not feel really welcome. No damage report for deposit, no replacement of broken couch tables that we noticed while check in. I dont know if I would like to book again. Service and trust is very important. Habitat comment: Dear Monika, thank you for your honest feedback. We are very sorry that you had this ipmression regarding the check-in. We will pay better attention on warm greeting and we appreciate your suggestion. It would be our pleasure to welcome you back and prove our quality service for you. Very nic aoartnent. Good locarion. Clean. Modern. New furniture. Io e la mia famiglia abbiamo trascorso un piacevole soggiorno in questo appartamento , dotato di tutti i comfort, perfettamente arredato e in posizione centrale. Great apartment. !5 min. walk from Sagrada Familia Cathedral. Close to metro station. Great space for family of 4. Functional and stilish design. Quite neighborhood. Close excellent supermarket. Comfortable, well equipped and right next to Saint Pau Dos de Maig metro. Only downside was a stuck shutter. This Barcelona Apartment is a new edition to our selection. It is located 15 minutes walk from the Sagrada Familia, and 5 minutes from Sant Pau Hospital. Be the first to stay and review! NEW! Cozy and modern apartment in Barcelona decorated with a style inspired by jazz music. It features a nice terrace.